I wasn’t going to do a holiday gift post because every other beer blog (like Naptown Pint and Miss Lupulin) already seems to have this covered, but they also seem to have missed many of my favorites so I thought I would make a quick list of beer gift highlights. The hop chart is one of the greatest creations known to the hop loving world. It’s not just a practical guide to hop bitterness, flavors, and aromas, but it’s damn gorgeous! Click here to zoom in and truly appreciate the level of detail that was put into this work of art. Every homebrewer should have this as a reference and bar/brewery decoration, and every beer lover that wants to learn about hops should put this on their wall. I actually own two! The main downsides to using a growler is that your beer can go flat too quickly or it can let in air that can spoil your beer. The TapIt Cap is a picnic tap and CO2 pressurizer that essentially turns your growler into a mini-keg, keeping your beer carbonated and away from the evils of oxygen. I haven’t personally used one but I’ve been watching the development closely and have heard great things. They’re made to fit most standard growlers and should begin shipping just in time for Christmas! 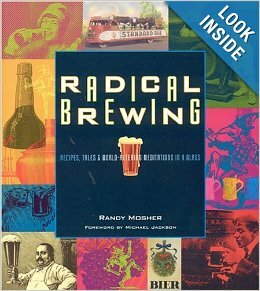 Randy Mosher is one of my absolute favorite authors when it comes to beer and brewing. This book is full of amazing beer facts and history, along with recipes, tips, and techniques for both experienced and brand new homebrewers. This is also the #1 book for someone that is still on the fence about homebrewing and just needs a little nudge in the right direction. I still turn to this book for inspiration and entertainment. I actually own two copies so that I can loan one out and always have the other on hand! First of all this is a great growler. It’s vacuum insulation will keep your beer cold for hours and hours. It’s pricey, but it’s also uncompromising, and the best part about the Drink Tanks Growler is the Keg Cap (see below) that essentially turns this growler into a mini-keg (sold separately). Word of warning though, this type of growler with a bail lock lid is illegal in some places. Make sure your local alcohol laws don’t require a screw on lid before purchasing this for your beer lover. However, if you want to use this to haul your homebrew then local growler laws be damned! This is the best way to haul your homebrew to a party or club meeting if you primarily keg your beer and don’t want to worry about bottles. This cap is the main reason for recommending the Drink Tanks growler. It turns the growler into a personal keg, and is specifically designed for the above growler. Again, the only word of caution is to make sure this is legal where you live. Just call a local growler shop and ask if they can fill it. Handmade gifts are always appreciated, and handmade gifts full of beer will win you best friends for life. If you have the time then put together a beer advent calendar. It’s a bit late for this year, but if you do it today then you can pull out two beers a day until Christmas! This will also take care of next year and the next because no one is going to complain about getting this gift every year! Previous Why I Love Prohibition, and You Should Too! Love the beer advent calendar. Definitely want to do that next year. The beer advent calendar is possibly the greatest idea in the history of ever. I may make a beer advent calendar to put on the front of all my beer taps! Can we just like… make a beer advent calendar that — Hooray! — counts down to February? I think I may do that — One month. 31 new beers. Ooooh… idea brewing. Could be a fun challenge.